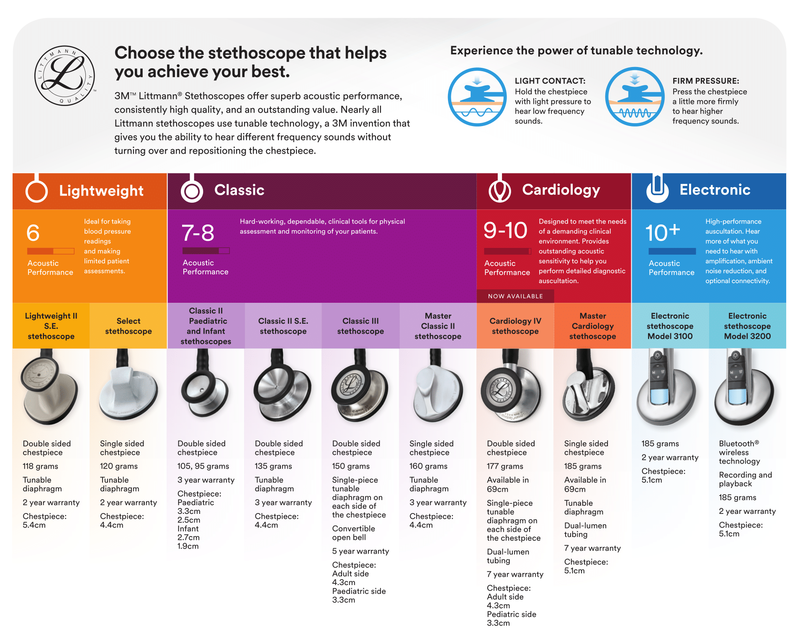 WHAT STETHOSCOPE IS SUITABLE FOR YOU? We have many different types of stethoscopes for sale in all price ranges and ranges of quality. The Stethoscope which is most suitable for you, depends primarily on what you need the stethoscope for. Have a look at our range of stethoscopes in NurseOClock UK. A chest piece made of stainless steel metal is more precisely manufactured, and makes for a better connection with the membrane to the chest piece. The steel metal chest piece helps provide a more clear sound quality for a stethoscope. A metal chest peace offers a less sensitive sound quality than one made of stainless steel. The price is therefore often lower than a stainless steel chest piece. An aluminum chest peace is lighter but less sound sensitive. A stethoscope has a single tube or a double tube. In a single tube stethoscope there is one tube that connects to the chest piece, the tube then divides into two which ends into the ear loop which then goes into either ear. The stethoscopes with a double tube has two tubes where each tube goes from the chest piece to the ear. Our own Rappaport Stethoscopes use two separate tubes that you can see but the more expensive Littmann Cardiology III, Master Cardiology and Cardiology STC have the double tube system hidden in one tube. A double tube stethoscope is more sensitive than a single tube. A simple chest piece has a membrane om one side. This chest piece is often used by cardiologists for listening to the heart. Generally a simple chest piece has a wide frequency range. A two-sided (Dual Head) chest piece is the most popular. The chest piece has one side with a membrane for listening to high frequency sounds (heart), the same membrane as a simple chest piece. The other side of the chest piece, called a bell, can be used for lower frequencies, for example chest cavity sounds and can be rotated so that one side can be used at a time and no noise is lost or absorbed. The membrane collects the sound waves and transports them into the tubes to the listening ear. A membrane should have a high degree of flexibility and a minimum sensitivity to deformation. Traditionally a chest piece has the combination of a bell and diaphragm membane. The bell is meant to be used for low frequency sounds. The diaphragm membrane should be used for high-frequency sounds. You can also have a stethoscope with a tunable membrane. It was developed to hear high and low frequencies through one chest piece, making it more convenient than removing the chest piece from the patient and adjusting it manually. As with a traditional bell, when using a stethoscope equipped with a tunable diaphragm, one should use light pressure to hear low-frequency sounds. To hear the high frequency sounds you add pressure. This causes the suspended diaphragm to move inward, resting on the internal ring of the chest piece. When this happens, the low-frequency sound waves are reduced, allowing the high-frequency sounds to be heard. Electronic stethoscopes are fast becoming top sellers. These are the traditional stethoscopes which use air in the tube for the transfer of sound to the listening ear. Electronic Stethoscopes are becoming more and more popular. In these stethoscopes, the signal is amplified (up to 24x) and the ambient and back ground noises is reduced. As a result it has extremely precise and accurate sound quality. Another huge advantage of the Electronic Stethoscopes such as the Littmann 3200 is that it can connect to a computer via Bluetooth. This allows you to share files with colleagues or share sounds with students and also a major advantage is saving your files for later comparisons and referrals. Littmann is the number one in the world of stethoscopes. The Littmann Stethoscopes are made to a very high quality. MedToolz stethoscopes have a good price / quality ratio. Prestige Medical is an American brand that offers stethoscopes at affordable prices. Below you will find a resume that will helps you to choose the right stethoscope for you. Cardiology Auscultation Diagnose Stethoscope with superier accoustic quality and a unique patented chest piece design. 9+ Littmann Cardiology S.T.C.